DESCRIPTION: Shea butter and real strawberry 24 hours hydration for dry to normal skin! This innovative 24-hr moisturizer containing shea butter and strawberry extract moisturises the skin for extended periods. The time release formula ensures there are bursts of moisture at regular intervals. INGREDIENTS: Water, light liquid paraffin, glycerin, stearic acid, glyceryl hydroxy stearate, glyceryl monostearate, hydrogenated polyisobutylene, triethanolamine, hydroxy ethyl urea, aloe barbadensis (aloe vera) extract, butyrospermum parkii (shea butter), fragaria vesca (strawberry) extract, cyclomethicone and dimethicone crosspolymer, isopropyl myristate, cetyl alcohol, polysorbate 80, 2- phenoxyethanol, methyl paraben, propyl paraben, amaranth Cl no. 15985, fragrance. DIRECTIONS: Apply daily morning and, if needed for extreme hydration, then in the evenings too. Wash your face with Lotus Herbals Jojobawash active milli capsules face wash before using the moisturizer for best results. COST: INR 205 for 60g , INR 305 for 120g. All the details about the product including the complete list of ingredients and directions to use are mentioned on the back of the tube! 1. Quite affordable and easily available both online and offline. Buy it from here! 3. The moisturizer has a mild and pleasant strawberry cream fragrance which fades away soon after application! 4. A pea sized amount is enough to cover the face and neck properly although you might need more depending on your skin type! 5. This moisturizer relieves the skin of all the dryness and stretching and makes it feel soft and smooth! 1. The moisturizer doesn’t stand true to its claims of providing 24-hr moisturisation… Although, it still does keep the skin hydrated for about 10-12 hours! 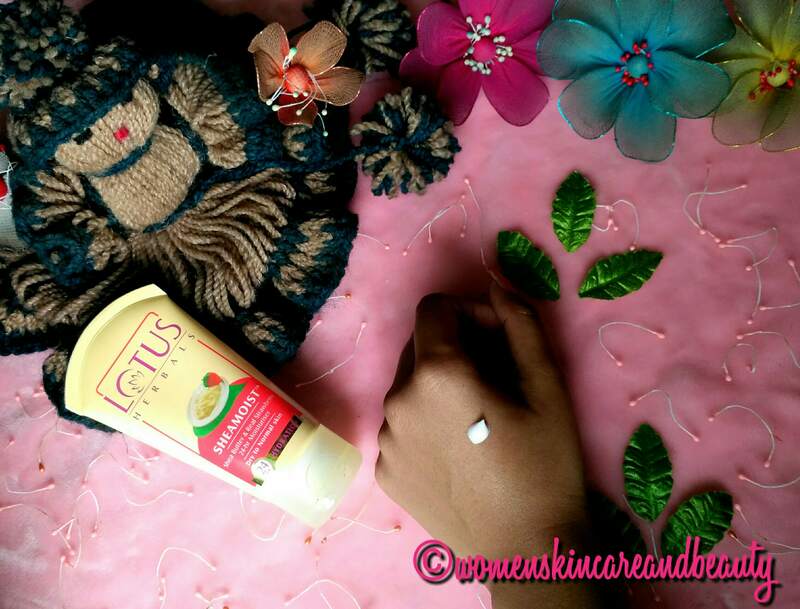 I love the products from Lotus.. specially their tan cream .. works so well for me .. 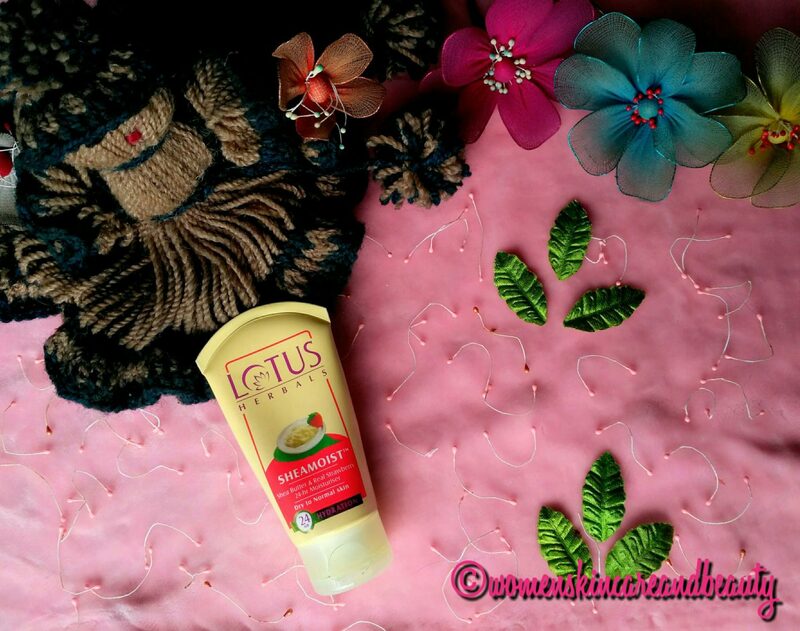 I love lotus products and would definitely love to try this new one… Thanx for sharing such useful post. What a cool name for the moisturiser. I like the fact that it can keep the skin hydrated for atleast 12 hours. Exactly what I need. Shea butter and Strawberry are my favorites. Would love to try sheamoist mositurier for my dry skin. Its okay if it does not provide 24 hours moisturizer. 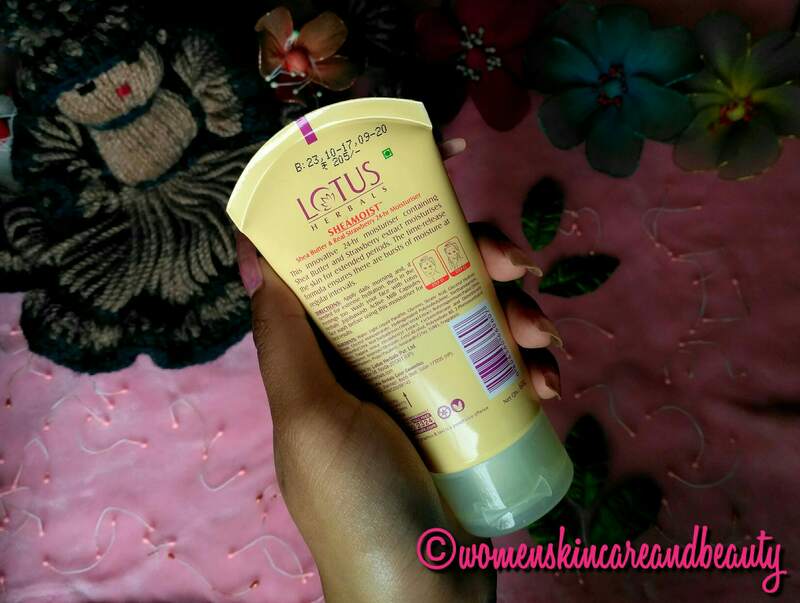 I have used this moisturiser by lotus herbals and completely in love with the rich formula and hydrating ability.. beautifully written..
Lotus products are promising indeed. Thanks for sharing the detailed review. Shea butter and strawberry sounded promising…i actually like the sound of it .. Maybe i can try for summer use as i have dry skin. I have a combination skin type too and have used this product. Lotus is quite a trustworthy brand. I have not tried Lotus Herbals products in ages. The moisturiser sounds really good. However I do not mind reapplying after 10-12 hours. Do try it then! 🙂 You will like it! 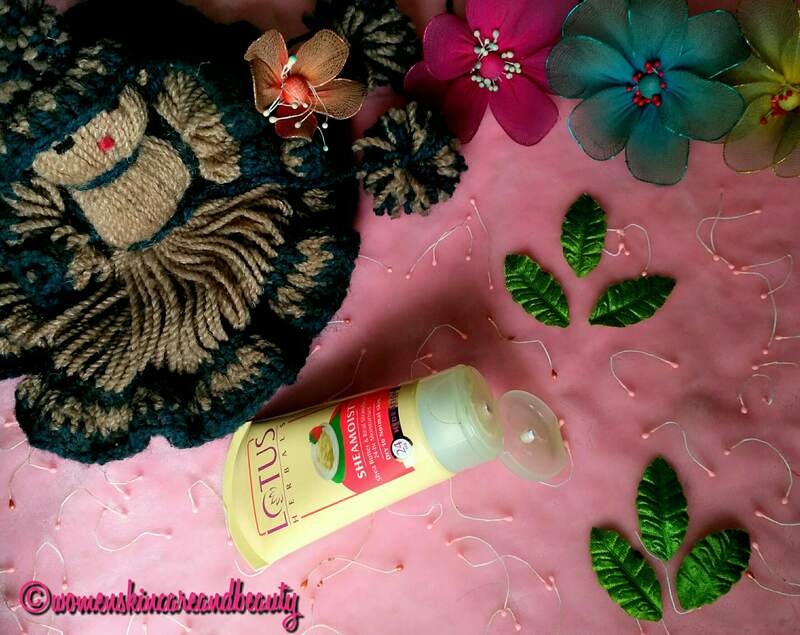 Lotus is one of the most trusted brands, and this product is one of their good products! Lotus products have been my favourite since teenage. They have products for all skin type. Love that this skin gives enough hydration specially during winters. I too have some what this skin combination. I would love to try this. Once I have used this cream. I like its rich formula and texture. It is suitable for very dry skin. I do have very dry skin and I am sure this review of lotus moisturizer would really going to help me. 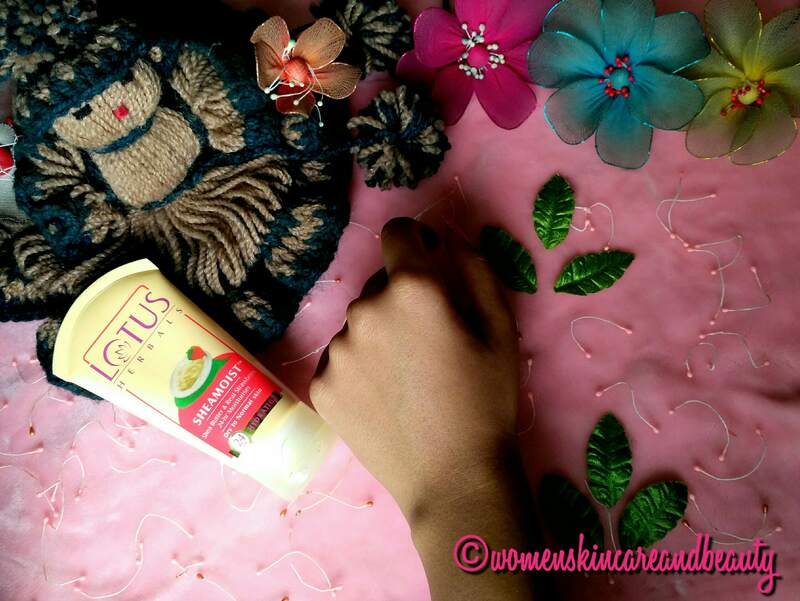 I have used Lotus products in past as well and totally loved. Shea butter and strawberry is a great combination for the skin. Lotus Herbals is indeed a great brand to use. I have naturally dry skin and in summers it still becomes little soft due to the sweat and heat. I am sure this would be great on my skin during winters. I like Lotus products and find them really good. Haven’t tried this one yet. Sure will. I always love lotus product and this looks very promising..
Nice review. I will be definitely try this product in winter when my skin needs some good moisturiser but not super greesy one. I have extremly dry skin and after reading your post would love to try this for sure. Infact these days I am hearing many good feedbacks about lotus herbal. I have an oily sensitive skin, and most of the products doesn’t suit my face. Hence I keep distance from all. However, this is good and from a trusted brand. Will share among my friends. I have a combination skin type too and if it gets dry and stretchy during the winters then I don’t think I should go for it. How about this product in summers??? ?